My first experience with this run was as a boy. My Boy Scout Troop would do our yearly 50-miler Whitewater Canoe Trip on the Trinity each year and on the first day of this trip, we passed the confluence where the South fork joins the main Trinity. 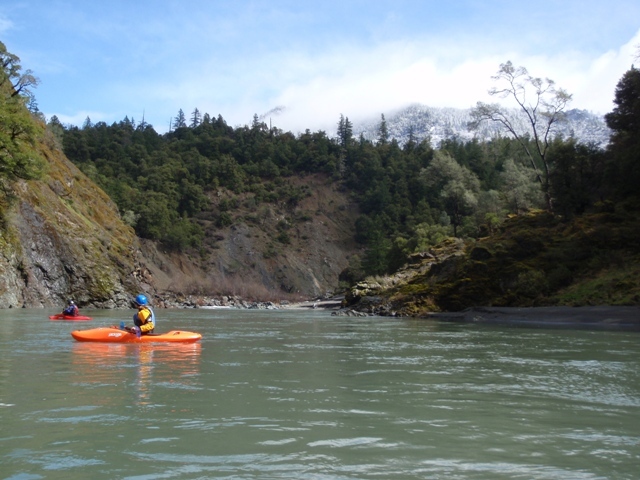 Once I began kayaking a bit later in life, I immediately wanted to get on the south Fork to explore up river. Finally three years later I have had the opportunity to do the lowest good section on the run. 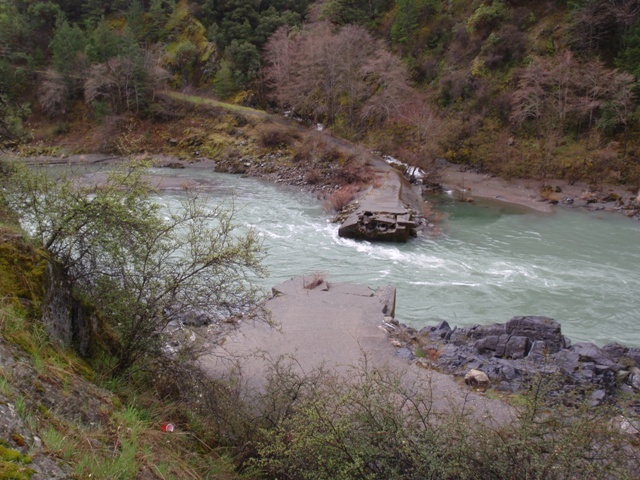 The benefits to doing just the lowest section (not going up to Hyampom) is that the shuttle is a mere 15-20 minutes as opposed to some 2 hours, it is a one day trip from Redding or Arcada, and there are no portages. The run was beautiful in nature, which came as a bit of a surprise to me after the drive to the put-in and take-out. On the drive you see houses and civilization all over, just above the river. However, most of the houses are just over a plateau and can not be seen at all. 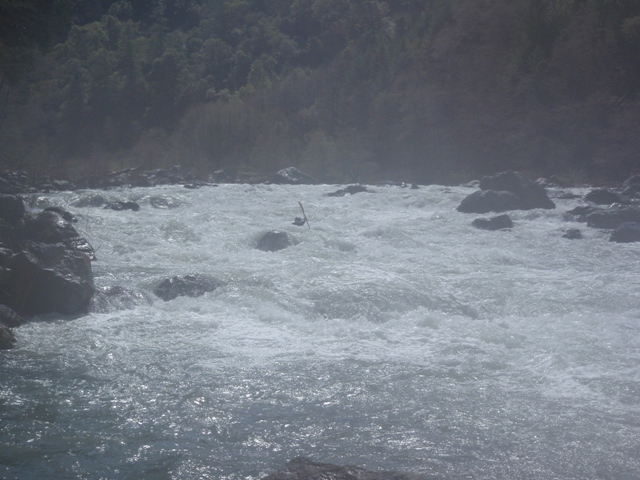 Leaving you with one of the most amazing scenic rivers I have been on. In total, making me curious as to how spectacular the upper sections are and resulting in me already having plans to go out there and do an overnighter on the upper section come warmer weather this spring. Finally, be aware that the gauge for this run is in Hyampom which is some 20 miles or something like that up river. The day we did this the gauge read 2,100 cfs or so, but at put in we all agreed it was at least 4,000 cfs or as much as 6,000 cfs. 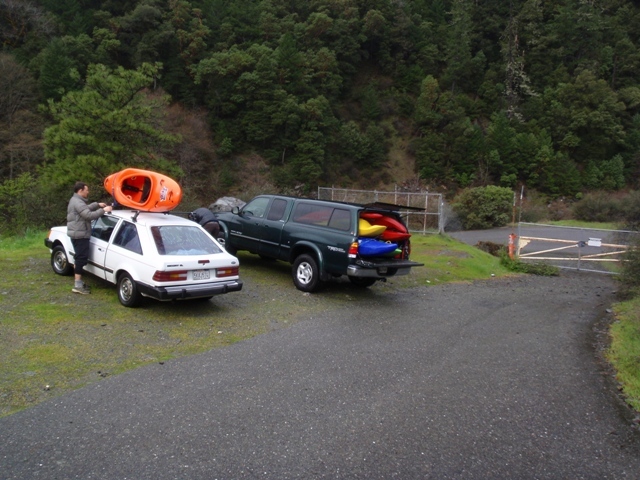 I have been told it can be done with the gauge reading up to 6,500 by kayaks, but for rafts the cut off is more around 4,000 for some, but 2,000 for the one rafting company that I know of that runs this stretch regularly. 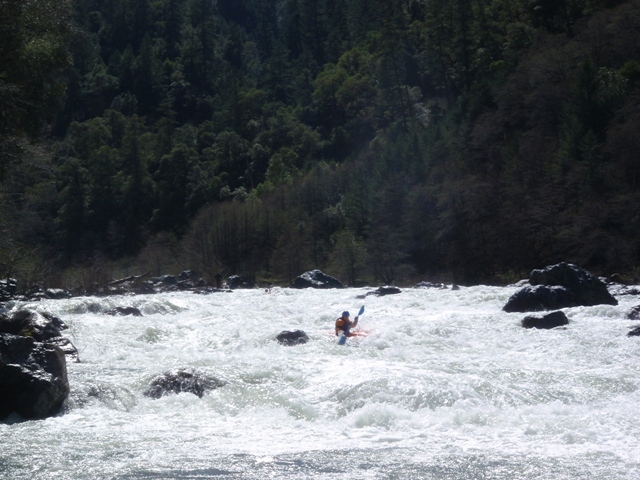 I have since gone back and run it at 1,600 at Hyampom, that day I figure we had about 2,000 cfs on the Three Bears. Long Rapid (III). 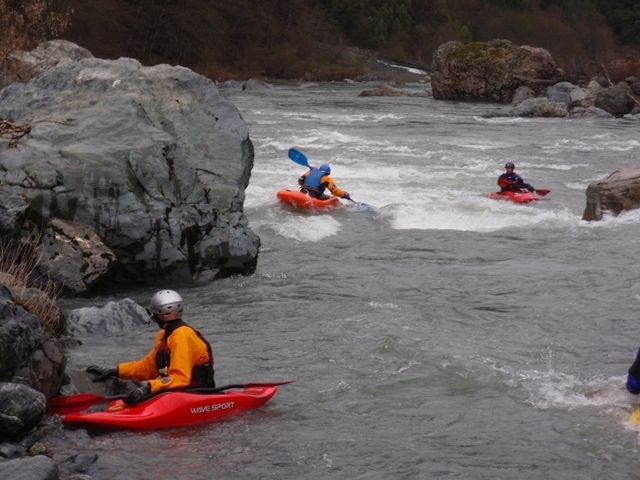 Near the middle of the second mile comes long rapid on a right turn. 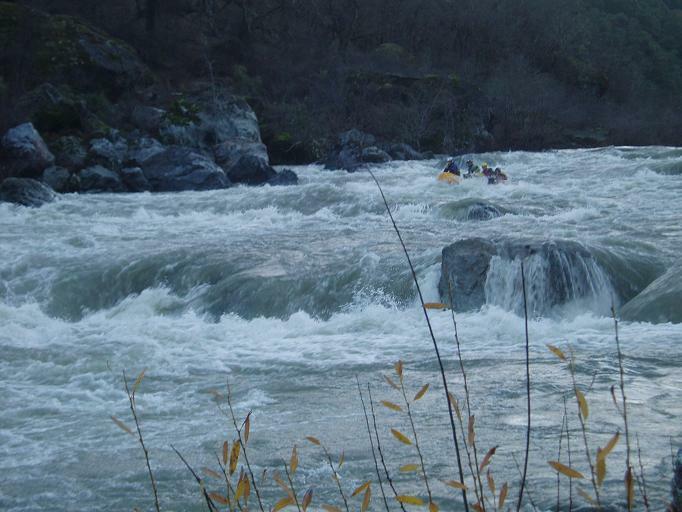 This rapid was just a bunch of large holes with swirling eddies and bubbles. 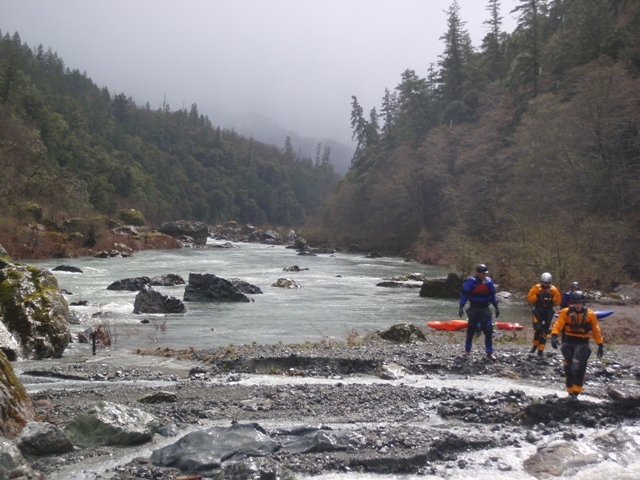 It was a nice warm up for negotiating the big water rapids down below (as it had been 6 months since I had been on big water). Anyways, we ran down the right side then on the S turn moved back center. There were some very large holes in the middle/left at the op. Big? (II or III+). 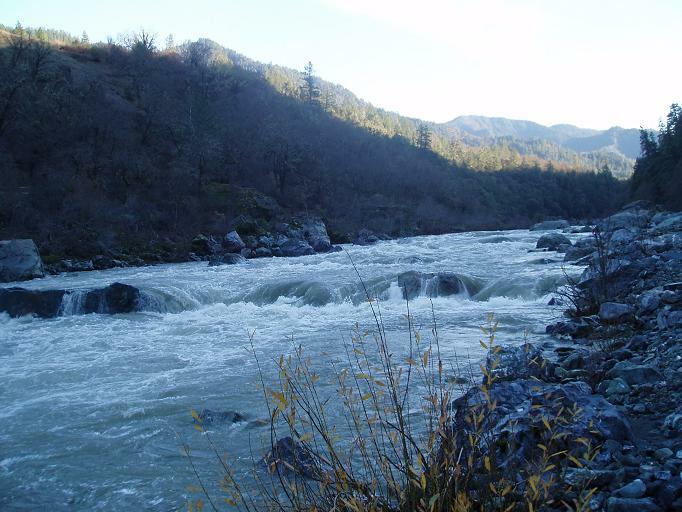 On a sharp left turn you see a the far side of the river drop over a cascade and you might think there is a big rapid coming. If you stay on the left side it is simply class II. The left side has some clean lines into holes but is harder. False Poppa (III-). 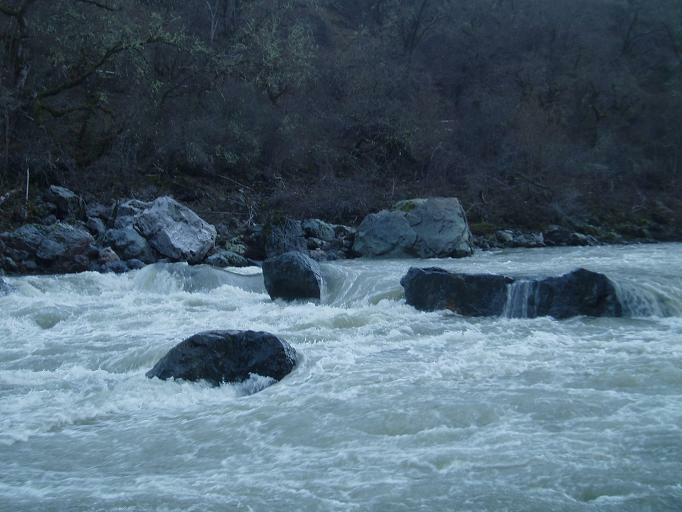 You will see large boulders spread across the river, and a left bank covered with them. This looks like the entrance to Poppa Bear but it is not. This rapid had some holes to avoid, none too bad. I ran it center then left. Poppa Bear (IV). 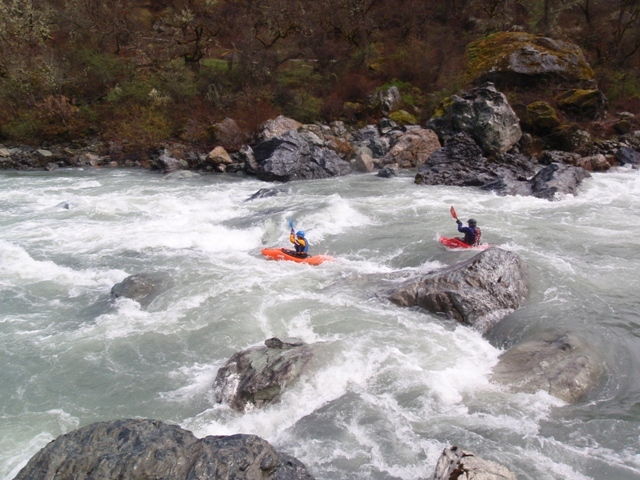 At our flow, this rapid was the easiest of the Three Bears. Massive holes and pour-overs make mistakes hurt. We entered down the right side, ferrying behind the first large hole. From there, there are two more massive holes in the middle of the river, about 50 feet and 150 feet downriver. We stayed left on both negotiating the “smaller” holes in fear of the big ones in the center. The raft finished on the right at the very bottom, not sure how it ran the top. Just around the corner is the Momma Bear. Momma Bear (IV to IV+). 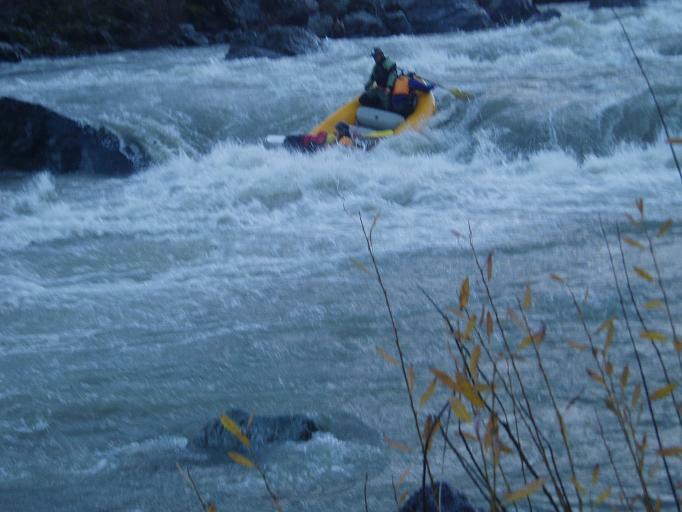 This rapid was easy for us in our kayaks, but gave the raft a harder time. 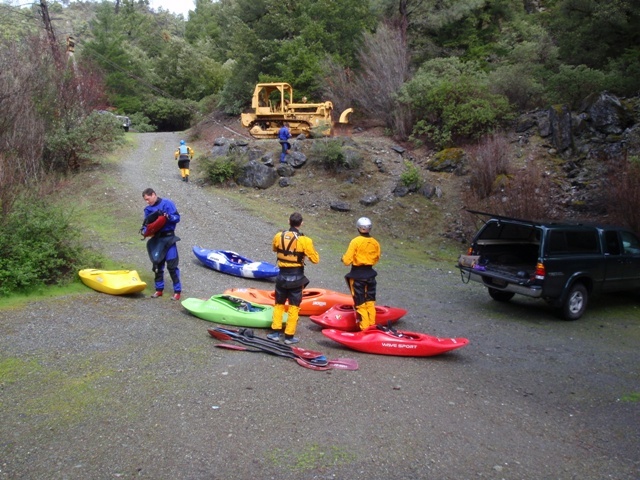 There is time to make moves in a kayak, and cut behind holes to ferry, rafts are more stuck in the current and end up hitting a few massive holes. The rapid has a entrance river wide hole, but easy windows exist in it. There is then a very large hole on the left and right. Kayaks cut left behind the left hole, and headed to the left shore avoiding a few holes in the center, and boofed the exit river wide chute/ledges. 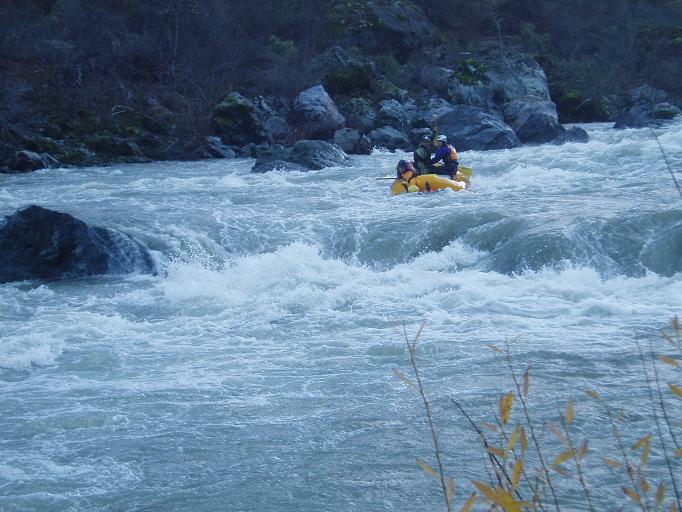 The raft went down the center, dropped some swimmers, and ran the middle chute. The second from the right was the most fun looking and seemed reasonably clean. Easily scouted/portaged on the left. Baby Bear (IV to IV+). 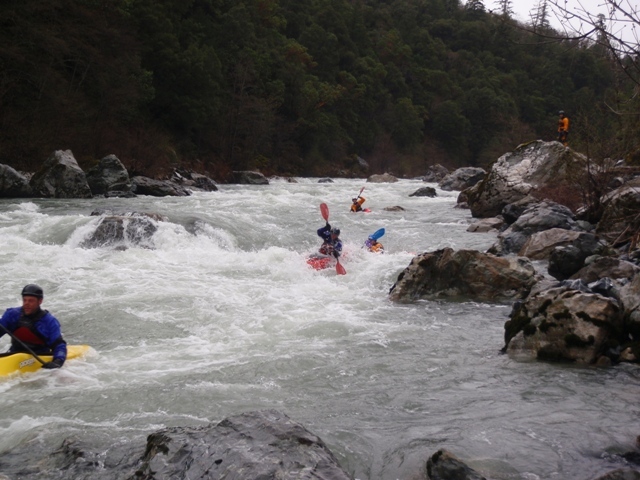 Again, just around the corner lays this rapid. 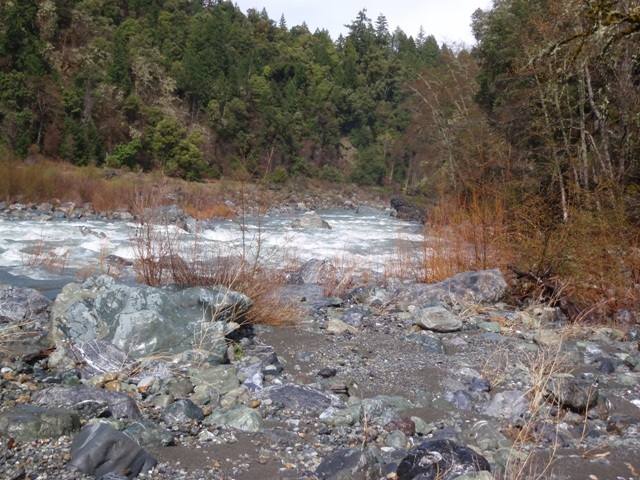 At low flows this rapid is the easies of the Bears, at out higher flows this was not the case. It had the hardest must make ferry. We entered right, ferried left below a large hole, just above a very large hole, and ran out the rest. Make sure you keep working left as just below the very large hole is a fan rock which wraps at lower flows, which is then followed by a few very large holes which all fold into each other. All the holes can be avoided on the left if you ferry far enough before being swept downstream. Goldilocks (III-). Just around the next right turn comes Goldilocks. 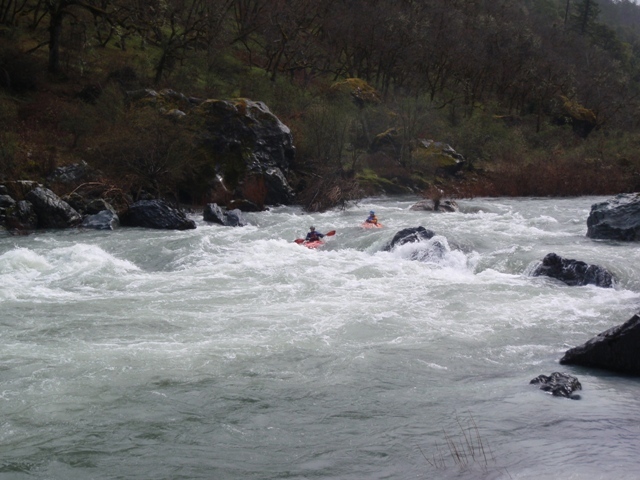 This rapid is run down the left (or right is class II- at high flows). 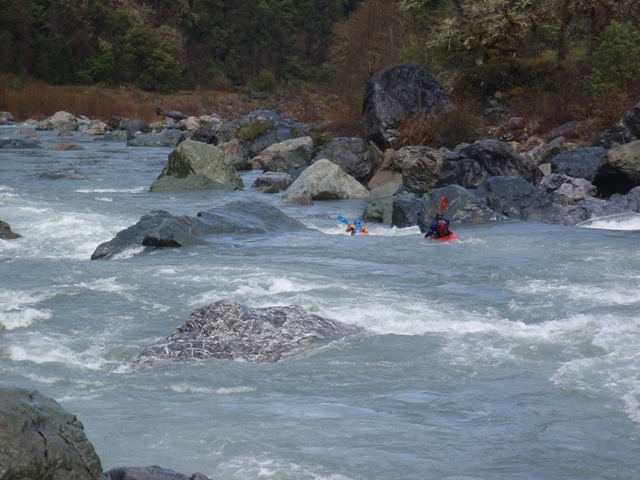 Apparently at slightly lower flows there is a rock just poking up in the wave train on the turn which has been known to flip rafts. Take-out: Take Highway 299 to the town of Sawyer. Turn up South Fork Road. There are no road signs so here is a fork by fork run down. At the first fork, a dirt road leaves to the left, stay on the paved road to the right. 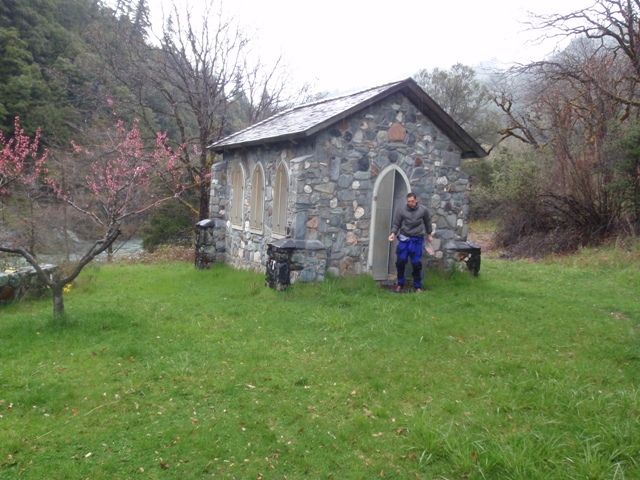 After seven miles on south Fork Road, you come to a fork with a sign of a peach farmchapel, go right You immediately come to a triple fork, stay left and follow “Gate Closed” signs to the gate. This is the Low Water Bridge take out. Put-in. Go back to South Fork Road and turn right. You come to another fork, one road goes left and high, the other right and low, go left and high. 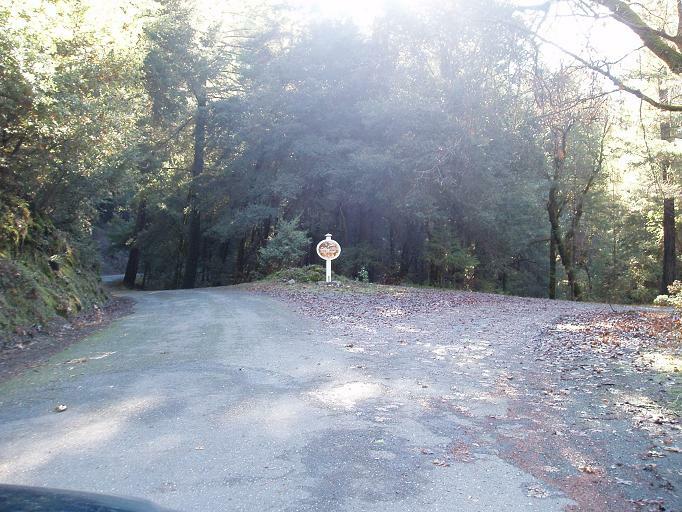 Continue until you come to a sign for “Tod’s Ranch River Access,” stay left (marked “Dead End”). After a little ways you come to another fork where again one road goes left and high, the other right and low. Stay right and low. This road ends up at a little circle, park here. There is a gravel road/path down the left side that leads to the river.